Adventureland drew from real life: plants, animals and explorers. It was meant to complement Disney’s pioneering and award-winning wildlife documentaries. Frontierland drew from America’s history. With the unexpected Davy Crockett craze, Frontierland also had a surprise star, even in absentia. Main Street, U.S.A. took its cue from small town America, specifically, Fort Collins, Colorado and Marceline, Missouri. It had Harper Goff’s and Walt Disney’s memory to draw on. Fantasyland drew from the movies and storyboards that Disney had already made or was planning on releasing in the relatively near future: Snow White, Pinocchio, Sleeping Beauty, Alice in Wonderland and others. The research and creation had already been done. It just needed to be adapted into 3D. Tomorrowland was a problem. Its subject matter didn’t really exist, yet. 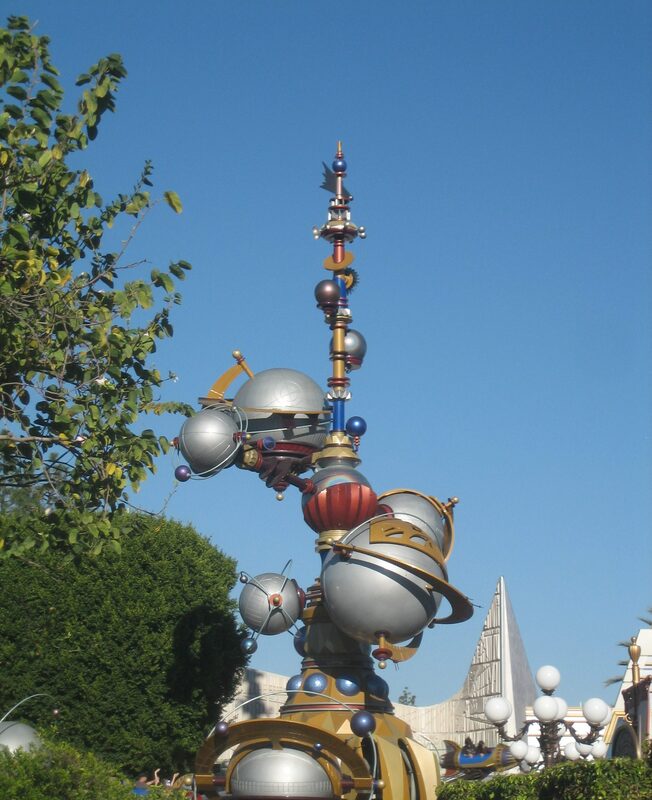 “[Tomorrowland] was the most difficult because everything in it had to be created, while the other lands were the result of research” said Imagineer Marvin Davis (as cited in Walt Disney’s Imagineering Legends and the Genesis of the Disney Theme Park, Jeff Kurti, 2008, p. 35). Tomorrowland has always been a problem for the Disney Company. In Paris, it solved the problem by recreating the tomorrows of yesteryear based on H. G. Wells and Jules Verne writings. In the U.S., they haven’t been able to solve the riddle. Americans are less familiar with classic science fiction writers, so the Disney Company went a long time ago in a galaxy far, far away, and to infinity and beyond while shouting “Excelsior!” and “Just Keep Swimming!” without really considering the subject of tomorrow. Space Mountain, and the Monorail are the only attractions left that represent the future, with an honorable mention to the Astro Orbiter. Tomorrowland has stopped moving forward because Disney found that as soon as they created something it was already on the market and no longer from the future. The future can’t be researched. It must be imagined and created. Unfortunately, creativity is messy, time-consuming, and a matter of trial and error. A business can’t rely on creativity to make a profit, so it settles for what’s easy, what’s already made, and what will bring in the most amount of money. That makes it our job to imagine a future we want to live in and then to create it. Sure, Tomorrowland is a lot of fun, but in order for the real tomorrow to be fun, we have to be its originators. Live to improve the planet, your life, and the lives of your progeny. Keep moving forward. Try our Tomorrowland quiz at penguin8.com.